"Marathon Festival Nagoya-Aichi 2017" was held from 10th to 12th of March. 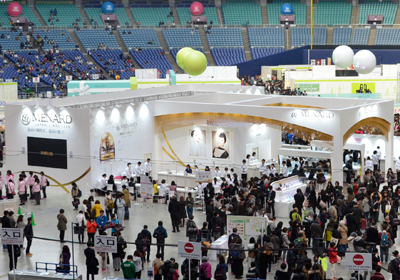 Nippon Menard Cosmetic ran a booth at Nagoya Dome, the main venue of the Marathon Expo held during the Marathon Festival, and livened up the whole event as a gold sponsor. The number of visitors to the Marathon Expo was 126,252, exceeding that of the previous year by 871 people. The MENARD booth was crowded with a lot of visitors and runners all the time and created a lively atmosphere during the event.